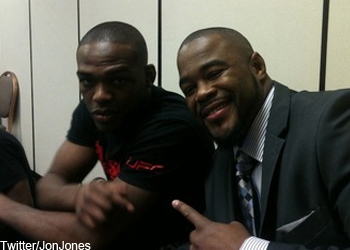 Unfortunately for freshly-minted light heavyweight champ Jon Jones, some of the shine from his dominating performance at UFC 128 is being overshadowed by his impending scrap with former friend-turned-foe Rashad Evans. Although both teammates previously professed they would never fight for real, UFC president Dana White is the one that calls the shots inside the Octagon. MMA’s big boss has ordered for Jones’ first title defense to come against his buddy. Evans took to his Twitter early Sunday and brought to light some interesting information regarding his relationship with now-former coach Greg Jackson. Although they claimed to become as close as “brothers” under Jackson’s watch in Albuquerque, New Mexico, it appears “Suga” was initially sour on the idea of bringing “Bones” to their camp several years ago. In fact, Evans claims he saw this awkward predicament developing from a mile away. Perhaps the day Jones arrived is when Evans discovered Jackson had already picked which side of the sand he would eventually stand on. “Many of u probably already seen that I got offered the title shot &; decided 2 take it. @jonnybones fought amazing! I’m very happy 4 him! I will not use Greg ever again.. I really haven’t used him in a while anyways.. In my last 2 fights I trained with him 5x’s..
Greg brought this situation about. He brought Jones on board a while back against my wishes &; here we r today. so I decided 2 leave Greg because I felt like he didn’t have my best interest anymore. Greg is not the same coach he use 2 b.
that was the UFC that had me go in the cage! The moment belonged 2 Jones 4 sure! Respect! * Evans then went on to Re-tweet an interview with MMAHeat to emphasize his decision to leave Jackson’s.